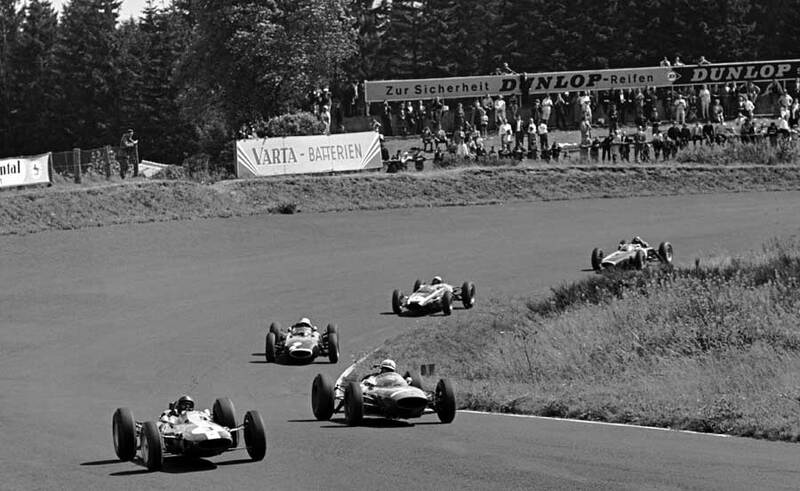 Next stop on the grand prix calendar was the notorious Nürburgring, widely considered the toughest and most dangerous racing circuit in the world, with 172 corners over 14.2 miles. Jim Clark's unbeaten run of victories was broken by former world motor cycling champion John Surtees, who notched up his first championship win on four wheels, in a furiously fast race full of incident. Built by the German unemployed in the early 1920s and named after the medieval castle of Nürburg that sits on a hill behind the paddock, the Nürburgring is situated in the Eifel mountains, south of Cologne. It is particularly demanding for drivers because the road plunges and twists continuously with many of the corners deceptive and challenging. In the first official practice session, oil on the track caused problems for many drivers, and Innes Ireland was lucky to escape from a spectacular crash. His BRP Lotus-BRM entered a fast right-hand bend, hit a patch of oil, flew off the road over the bank and plunged through a thick hedge before coming to a stop. "I was travelling at 70 to 80mph as I went into the bend", said Ireland. "Suddenly the whole car slid and I felt myself rushing along this hedge. There was oil everywhere." Although threatening clouds hung over the mountains on the day of the race, the 350,000 crowd enjoyed a sunny afternoon. Clark started on pole and immediately established himself in the lead, closely followed by Richie Ginther and Graham Hill. Jack Brabham was left stranded on the grid with cooling problems, and it was a full eight minutes before he was able to get going. Willy Mairesse, appearing for the first time since his serious accident at Le Mans in June, crashed badly again, on the first lap, narrowly avoiding spectators. He was airlifted to hospital with a broken arm. Also on the first lap, Ireland collided with Lorenzo Bandini, putting both cars out, but causing no injury to the drivers. Shortly afterwards, Hill's car came to a grinding halt with gearbox trouble, and Bruce McLaren moved up into third in his Cooper Climax. But only a lap later, McLaren himself crashed and was also taken to hospital, suffering from concussion and shock. Up front Surtees and Clark were contesting the lead, but Clark's engine was only firing on seven cylinders, allowing Surtees to take the lead on the fifth lap. By halfway, only 13 of the 22 starters were still in the race and Surtees was ahead by just over seven seconds. He extended his lead as the race continued, and when he took the chequered flag, anxious faces in the Lotus pit scanned the horizon looking for Clark, who eventually chugged in over a minute later. Surtees' win was the first for Ferrari since the Italian Grand Prix in September 1961, and put him in second place in the championship, 20 points behind Clark. "He drove a very fine race", said Clark. "My own engine kept cutting on one cylinder and I had to drive like mad to stay in."